We were lucky to have the opportunity to attend the Openstack Summit in Barcelona this year. The event has become a large event with a few thousand attendees and the scope is getting broader as Openstack evolves and matures. The schedule is very dense and a little bit of homework is necessary to maximize the value from the event – the sessions we chose to attend probably capture quite a wide subset of the different conversations that went on. Naturally, the keynotes were where the most important messages around Openstack were conveyed. (The clue is in the name!). 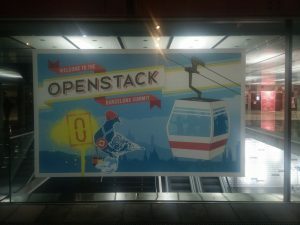 It was quite obvious that Openstack is trying to reduce its telco-focused emphasis and position itself as a more general offering for the enterprise. Banco Santander talked about their large deployment across 8 regions and how well it has been working for their diverse computing needs over the last couple of years; Sky also talked about their production deployment which also runs a diverse range of mission critical applications including software management for their STBs. The telecoms world could not be forgotten obviously – it has a large investment in this space – and Huawei and Deutsche Telekom had the opportunity to tell us how they are also believers with Telekom promoting a significant Openstack based public cloud offering. The keynote contained a couple of demos: the first one focused on the new container capabilities offered by Magnum – this enabled a sophisticated container based application to be deployed via the openstack dashboard and it worked very effectively. The second of the keynote demos showed the advanced reliability functionality offered by the Tacker and OPNFV enhancements to openstack – it demonstrated a telephone call continuing to function in the presence of connection loss (via cable cutting): system reconfiguration was so fast that there was no interruption in service. The Vitrage project which facilitated Root Cause Analysis to solve the problems was particularly interesting for us here. Other interesting tidbits came out of the panel session on the future of Open source cloud with a couple of journalists and an industry analyst from 451. An interesting observation was that Openstack was becoming the norm in the enterprise and can be viewed as an integration layer: many other systems will have to integrate with it. It was also noted that the lack of inspiring new features in the Newton release is an artefact of a maturing platform. A challenge for Openstack remains managing the complex patchwork of projects of which it comprises which have different tempos, motivations, levels of energy etc. This does make it difficult for end users to know what features she can rely on. Another interesting point was a common consensus that there will be an AWS/Openstack story evolving soon, driven by market demand. There were many other interesting talks and panels which we attended including one on the pitfalls of hybrid cloud (stilll a lot of work to be done, particularly around networking), the state of the Openstack/NFV world – this is evolving fast, but there is still a lot of work to do, with the current focus on just deploying NFVs. There was a talk on IPv6 on Openstack (still some issues with metadata and IPv6). This entry was posted in *. * by Sean Murphy. Bookmark the permalink.